I really can't add anything to any discussion about The Lord of the Rings series that hasn't already probably been said twice before. 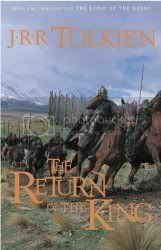 Grand and epic in it's scope and telling, The Return of the King is the final book in the series. I'm always impressed by the story, but I can't help but always feel that the ending seemed a little too easy for everyone involved. Of course, the emotion that comes through in the story is just as strong as ever, but this latest reading left me wanting more from the ending; something a little more tangible in the evil forces that threaten Middle-Earth. Maybe I've read it one too many times now, but the enigmatic nature of Sauron just seemed a little, well, too enigmatic for me this time. Still, you can't deny that this is one fine piece of fantasy literature.